Messe Düsseldorf has been operating for over half a century. What started in makeshift wooden premises in Düsseldorf city centre is now an internationally active company that is represented in all growth regions of the world. 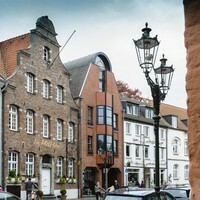 Düsseldorf’s tradition as an exhibition venue goes back over 200 years. The first commercial exhibition was held in 1811 in the hall of the old government chancery where 14 exhibitors from the Bergisches Land presented their industrial products to their new ruler at the time, Napoleon I . The proximity to the Ruhr area and its location on the Rhine became increasingly important factors for Düsseldorf’s development as a fair venue in the course of industrialisation in the 19th century. In 1880, when the Rhine-Westphalian industry was only a few decades old, a million visitors were already coming to Düsseldorf for the exhibition. Düsseldorf was established as a modern fair venue on 7 January 1947 with the formation of Nordwestdeutsche Ausstellungsgesellschaft mbH (NOWEA) . In keeping with Düsseldorf’s exhibition history and tradition of world exhibitions, efforts initially centred around the organisation and implementation of a “Commercial Trade and Export Fair”, although NOWEA quickly established itself as the city’s permanent exhibition corporation. From the end of the 1940’s numerous fairs and exhibitions in Düsseldorf accompanied the economic recovery of the young Federal Republic in the post-war era. The foundation of the NOWEA was one of a series of attempts to get the city and the country back on its feet. As a rather dark future was predicted for heavy industry, those responsible called for the establishment of new companies. In addition to the electrical, mechanical engineering, chemicals and clothing industries, they concentrated on developing the service sector. The new exhibition corporation was one of these fledgling enterprises. 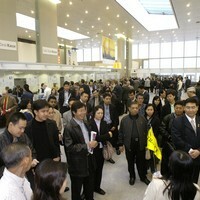 Over the years the trade fair concept has borne more and more fruits. In the mid 1960’s the existing exhibition grounds finally ran up against their capacity limits in the city centre . The call for new, larger exhibition grounds grew louder. After long deliberation, the Council of the City of Düsseldorf approved the largest local government project of the post-war era on 20 August 1968, the construction of the Messe Düsseldorf in the north of the city. On 3 July 1969 the council approved the funding of the project, which was completed within the 905-day planning and construction period. The result of the efforts was a regional planning programme developed specially for trade fairs based on an additive steel and glass construction system. Europe’s most modern exhibition halls were developed according to the modular 30 x 30 metre construction system: modern, clear, flexible and resilient. The new site was formally put into operation in 1971 with the “K“ International Plastic and Rubber Fair. 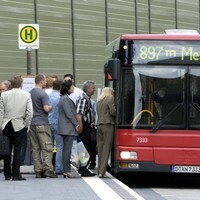 The company, meanwhile renamed “Düsseldorfer Messegesellschaft – NOWEA“, was able to gain new impetus through the “New Messe“. 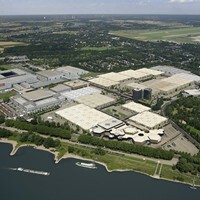 The proximity to Düsseldorf Airport and the excellent connection to the long-distance transport network were and are key venue assets. With the inauguration of the "New Hall 8b“ in Autumn 2007, the twelve halls that formerly existed have now grown to 19. 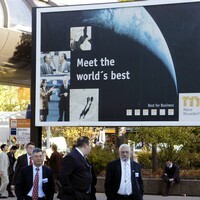 This growth was and is no coincidence: years of experience in the fields of machinery, plant and equipment, commerce, crafts and services, medicine and health, fashion/ lifestyle, leisure and the tried and trusted trade fair concept have made Messe Düsseldorf a strong and competent fair organiser. With the increasing globalisation of business, Messe Düsseldorf GmbH also sought new markets early on – and found them. 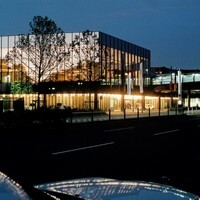 The company exports its know-how and its service in key international markets from its Düsseldorf base. Together with strong partners, Messe Düsseldorf is represented in all growth regions of this world, with the concept it has successfully operated for over 50 years, namely the Fair Concept. 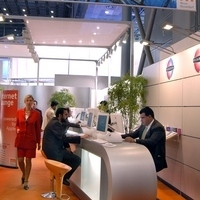 Messe Düsseldorf is active in China, India, the Czech Republic, Russia and the Middle East. In addition, 66 foreign representative offices look after over 100 countries around the globe. The same principle also applies here: 40 years of foreign fair experience with more than 4,000 organised events all over the world stand for international competence.The Messe Düsseldorf GmbH group, with fourteen subsidiaries and holdings and forty fair events in Düsseldorf alone, is now one of the largest fair organisers worldwide.